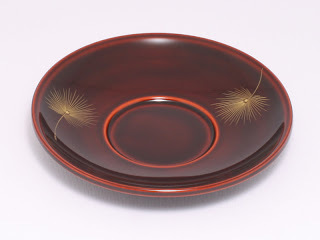 Urushi is the sap of the urushi tree. The sap of the tree contains a resin. The resin is processed to urushi. The urushi is very hard and durable. It has been used for coating woods for a long time ago by Asians. Evidence was found that Asians used urushi in the Stone Age. They used it for spears and arrows. and began to use it for coating for wooden tableware, boxes and combs. to generations, as has been done with tea ceremony custom. and other items around the Edo period (1600-1850).